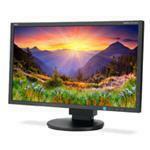 The 23" NEC MultiSync EA234WMi is an LED-backlit desktop monitor ideal for corporate environments. Designed to enhance work performance, this widescreen model features IPS panel technology with wide viewing angles and ergonomic adjustability. The LED backlighting of the EA234WMi allows for a slimmer profile, lighter weight and increased power savings compared to previous generation models. ControlSyncT technology allows users to control up to six EA234WMi displays in a multi-monitor configuration. Smart sensing technology automatically detects your work conditions to determine the proper display brightness with ambient light and human sensors, while a comprehensive input panel, including HDMI, DisplayPort, DVI-D, VGA and 4-port USB hub, connects users to the latest peripherals and future-proofs the investment.